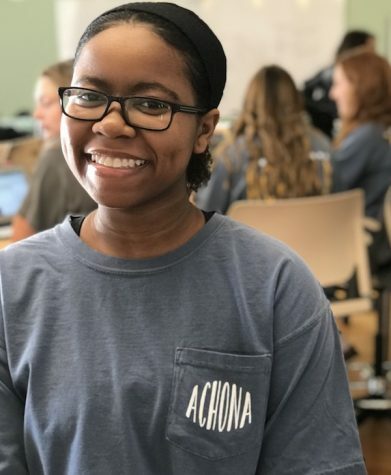 Tabitha Rucker is an Academy senior and first year staffer for ACHONA. She enjoys working with the aftercare students a few times a week. Rucker loves to scroll through her Twitter feed and find dank memes. Tabitha aspires to attend Spellman College in Atlanta, Georgia to become an education administrator, such as a Dean of Students or a Vice Principal. She has not 1, but 8 favorite teachers/administrators at Academy: Melissa LeBlanc, Stacy Filocco, Dr. Lauren Oetinger, Virginia Pendleton, Erin Krukar, Emily Pantelis, Olivia Martinez, and Principal Stephanie Nitchals. Her favorite album that came out this year was "ANTI" by Rihanna, but her favorite album of all time is "Coloring Book" by Chance the Rapper. Tabitha’s pop culture icons are: Michelle Obama, Shonda Rhimes, Kerry Washington, Alicia Keys, and Viola Davis. Rucker also enjoys sharing and liking photos on her Instagram. Another social media platform Tabitha spends time on is her Pinterest, where she shares her fitspo and healthy eating goals with her whopping 2 followers. Rucker the meme queen has some great ideas for new compelling articles this year. Tabitha looks forward to sharing her humor with the readers of Achona and her fellow Achona staff.